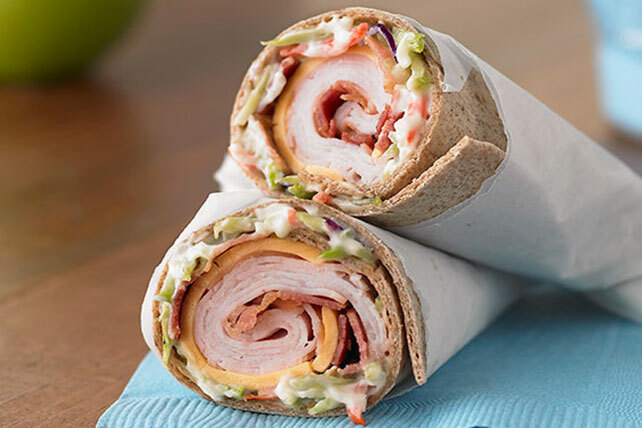 The classic turkey and bacon club sandwich gets all wrapped up in a whole wheat tortilla with crunchy broccoli slaw. Combine broccoli slaw and dressing; spoon onto tortillas. Top with remaining ingredients; roll up. Serve with a crisp mixed green side salad and fresh fruit to round out the meal. If taking the sandwich to eat at school or in the office, pack it in an insulated lunch bag along with a frozen beverage or container of yogurt. It will help keep the sandwich cold until ready to enjoy, and will be thawed in time to enjoy with the sandwich. Substitute coleslaw blend (cabbage slaw mix) for the broccoli slaw.